You need effective compliance and risk management. You need automatic reports and reminders. You need access from anywhere. You need access via PC, laptop, tablet, or iPad. You need to secure your data and documents. The modern business world requires effective and efficient systems – with ease of use, automation, and powerful search, query and reporting options. 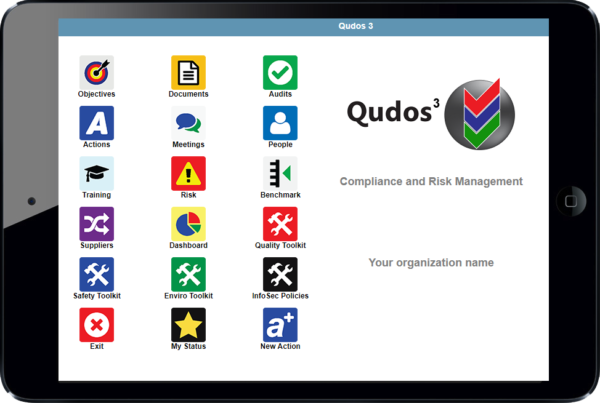 Qudos 3 is the all-inclusive solution for Quality, OHS and Environmental Management Systems - with an absolutely unrivalled combination of functionality and features - available in server or cloud options. Your system may be configured for just one compliance issue, or any combination of them in an integrated management system. Qudos 3 may be used for a single site, or across multiple sites - with no geographical limits, and on a wide range of computers, iPads, tablets, Surface Pros, and Smartphones. "The Qudos 3 corrective actions database has enabled us to better identify, escalate and flag issues in real time, this along with the statistical information Qudos 3 provides will allow for the continual improvement of our integrated management system into the future"
John Benson, Compliance and Management Systems Advisor. The concept of integration extends further. Qudos 3 enables a wider than ever range of tasks to be addressed in a cohesive manner - using one powerful application. Extensive tools to help you understand ISO requirements for a management system, and conduct system planning. Qudos 3 now includes an exclusive and comprehensive ISO 45001 Gap Analysis tool - fully integrated with action assignment, notification, management and progress monitoring facilities. Plan Objectives for your whole organization, and individual business units, locations, products, services, and processes. "IA Design has utilised both the Qudos consultancy and software offering and found both to be of a high quality. As a company transitioning to the new quality standard I have found their advice invaluable and the process simple and effective. I would recommend the software as it makes the mechanics of managing the system very easy." IA Group (Architecture / Security consultancy). Qudos 3 uses a robust, industry-leading MS SQL Server database to offer more secure, reliable data storage with the best options for analysis, reporting, and notification - helping you access important information and distribute it where needed in your organisation. This trusted platform will help you turn data into actions and better decisions. A range of security measures including advanced encryption are utilised to protect your data. Controlled access is via individual User IDs and passwords. Your own administrators may enable each user's view/edit rights access based on selected criteria to best suit your needs. The Master Document List displays approved documents in their native formats in read-only mode - eliminating the possibility of unauthorised changes to them. Authorised changes are by a controlled Revision process - requiring appropriate security permission and password sign-off. In major data-entry forms throughout the application - such as Objective, Audit Record, Meeting Record, Risk Assessment, Benchmark Assessment, and Action Forms - the integrity of data is protected by locking with unique User ID and Password. "Qudos 3 greatly assisted our London bus business attain ISO9001, ISO14001 and OHSAS18001 within 6 months"
For the technically minded, the Qudos 3 uses leading-edge Microsoft Dotnet technology - the industry standard for web-based, enterprise software. For the rest of us, that means that the user interface is a clean modern look in a familiar web browser environment. There is no installation necessary on client-side computers - resulting in much less maintenance work for IT personnel, no delays for new users, and multi-site / off-site capability. To save time and effort, Qudos 3 automates many tasks for you - such as scheduling document reviews, generating actions from meetings, audits and risk assessments, and generating email notifications. "The ratio of benefit over cost for Qudos 3 is enormous"
"Great software. Makes managing your QA/OHS/Environmental system a piece of cake"
The basic Qudos 3 is licenced for up to 5 full users + 1 bonus user + an unrestricted number Guest users who may view/print documents. Increases to licence size are available in units of 5. Each full user is licenced for full read/edit rights in all modules. Your own administrator may permit read/edit access on a modular, business unit, or location basis to best suit your needs. There are no concurrent restrictions - All users may access the software simultaneously. Cloud Software-as-a-service - with contract periods starting at just 3 months! The cloud hosted options offers a quick start and no hassles - we do the installation, provide secure, encrypted access, maintain your software in a secure data centre, and automatically apply any updates for you. We even do off-site backups of your documents and data each business day. Facility is also provided for you to take your own back-up copy on demand. You require little more than a broadband connection and a browser! If required, your system may be quickly converted to a self-hosted, full software licence at a later date. We believe the combination of these advantages offers a most compelling business case for any organisation seeking to manage compliance and risk. That's why we call Qudos 3 the Ultimate Solution for Compliance and Risk management.